Pledge to do your part! America Recycles Day is an annual event that rolls around each year on November 15 and has been celebrated in the United States since 1997. 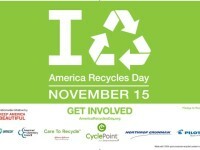 Thanks to Keep America Beautiful (KAB), which organizes this effort, we are reminded why we need to recycle. This year’s theme is “Bathrooms, Bags and Gadgets,” and highlights items that are often overlooked for recycling. These include haircare and mouthwash bottles; plastic bags, such as those used at retail stores, and plastic wrap used in packaging paper towels, toilet paper or dry cleaning; and consumer electronics and gadgets, such as mobile phones, tablets, game consoles, and televisions. It’s easy to take the “I Will Recycle” Pledge. And now until November 20, the America Recycles Day “I Will Recycle” Sweepstakes offers the chance for four people to win an Apple Certified Refurbished iPad mini 3! To enter, just post a photo on Twitter at@KABTweet or @RecyclesDay or@KeepAmericaBeautiful on Instagram holding a recyclable product that you pledge to recycle with the hashtags #IWillRecycle and #Sweepstakes. You must enable public viewing of Twitter and Instagram photos to enter. Keep America Beautiful may share tagged social media posts with its fans and four individuals will be selected at random to win an Apple Certified Refurbished iPad mini 3. For more details on how to enter, read the Official Rules. In the meantime, keep recycling all 365 days of the year!